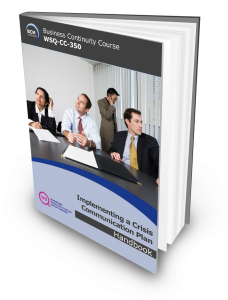 This 2-Day course is a unique Crisis Communication designed for participants who have no crisis communication but are thrust to assist his/her Crisis Communication counterparts as part of their role as an emergency and incident management, crisis management and/or business continuity management team member. The workshop would allow participants to identify relevant internal and external stakeholders of disruptive events and ability to formulate crisis management communications strategies, procedures and key messages. The workshop also will be able to provide them with the competency to establish crisis communication, and action plans to deliver key messages on behalf of the organisation. Completion of the 2-Day course also allows participants to achieve an internationally recognised Crisis Communication certification, .i.e. the Crisis Communication Certified Planner (CCCP)* certificate. * To achieve the CCCP certification, participants would need to attempt the Qualifying CCCP examination and make payment of SGD150 as part of the Qualifying examination fees. CC Certified Planner (CCCP) certification is awarded to participants who successfully completed the 2 Day CC-350 Implementing Crisis Communication Plan course and pass the Qualifying CCCP examination. To train participants who do not have a crisis communication background and are in the emergency and incident management, crisis management and/or business continuity management team, to have the competency to establish crisis communication management plan for their organisation. The CCCP Examinations is a 1.5 hours, 50 online Multiple Choice Questions done in an invigilated room either at BCM Institute’s designated exam venue. All course fees includes courseware and 2 tea breaks. SGD150 for the Qualifying CCCP examination fee.